My best friend gave me his acoustic guitar for my eighteenth birthday, and thanks to a combination of University, videogames and the ridiculous amounts of fan-mail I get on a near-daily basis due to my career writing about videogames on GamingLives, I’ve barely touched it. Oh sure, I can play a couple of tunes as long as you don’t mind Zelda, but after nearly three years my lack of experience is nothing short of embarrassing. Just before setting out to E3, I decided to spend some of my remaining time after packing getting back into playing guitar, only to give up five minutes later having broken a string. With this in mind, I was somewhat hesitant when approaching Bandfuse: Rock Legends; I’m certainly no good at playing guitar as we’ve so far established, and if I ended up breaking another string in public I may well have run off before cursing the rock gods for forsaking me. Luckily, no such breakage occurred, and the experience was a hell of a lot more fun than I’d imagined it would be. 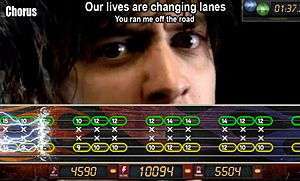 When Rock Band 3 came out, I was intrigued by the optional mode where you could plug in a guitar and it would tell you how to play it in reality. 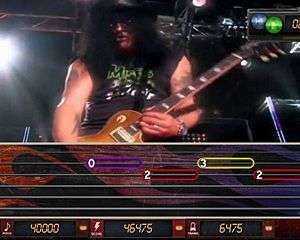 In Bandfuse: Rock Legends, that’s the default way to play the game; it’s an educational tool through and through, with every note, chord and trick necessary to play the song out from beginning to end fully present as you make your way through each difficulty setting. One key difference Bandfuse has to previous games like Rocksmith or the aforementioned Rock Band 3 is that the forthcoming notes approach on a horizontal plane, rather than the vertical plane Rock Band is well known for, and the, frankly, kind of confusing way Rocksmith sets itself out. This means that it’s far closer to the traditional note sheet setup and allows you to read more accurately and prepare more effectively for the upcoming musical onslaught. Not only is it easier to adapt to, it’s also quite forgiving, as an educational tool should well be, meaning you’re less likely to get frustrated as the game’s not going to start booing you if you miss a few too many chords. Rhythm games tend to live or die on their music, and Bandfuse’s setlist is one that’s at least very interesting. The songs confirmed so far cover a wide spectrum of rock, from Living Colour’s ‘Cult of Personality’ to Five Finger Death Punch’s ‘The Bleeding’, to Fall Out Boy’s’ Sugar, We’re Going Down’. The selection doesn’t just cover a wide range of genres, but guitar techniques too, as I found myself re-learning chords with Fall Out Boy, finger-picking with Incubus’ Drive and watching some impressive solo skills from people attempting Cult of Personality. The way each tier ramps up the difficulty also means that you can slowly ease yourself in with the general rhythm of the song, and I found that once I’d attempted a song on a lower difficulty then it was easier to adjust myself to the level above. It won’t just be a solitary experience though, as there is also the option to plug in a second guitar, a microphone and either play along with or battle against your friends. Adding in additional players takes away the song’s music video and cleans up to make it easier to discern which player is which as you fight for rock supremacy, though there was no vocal chart for singers in the demo’s current state. If you found you didn’t want to play along to the songs provided, there’s also a free jam mode included that lets you and your friends record some music of your own to then upload online and share with your friends. It’s a great way to encourage more creativity with the skills that players have learnt from their time with the game, but the lack of drum implementation may prove to be a detriment in future. As a game, Bandfuse: Rock Legends may be a tough sell to many; the rhythm genre is one that was over-saturated all too quickly and killed a lot of enthusiasm many may have had, but as a teaching tool, however, it could be an absolute stunner. In my short time with the game, I found it easy to pick up, fun to play and it made me more confident about playing guitar to the point where I felt encouraged to keep at it. I doubt it’ll make someone like me into the next virtuoso overnight, but it’s definitely going to be one that people who want to learn the instrument should seriously look into. With any luck, this could be the most fun you could ever have learning guitar.